When I think of the local kosher deli, my mind wonders to the world of black and white photography where I find an elderly couple, so deep in love and wise from their years together, standing beside barrels and barrels of home pickled cucumbers. Loyal customers cycle by to make their daily purchase of fresh food to feed their family The walls of the deli are lined with communal notices, some yellowed with time. For generations the couple have welcomed locals into their store as though they were guests in their own home and in doing so, they have created a hub that has kept the community together through the good times, and through the bad. The kosher deli in my mind doesn’t sell baked wontons or Chinese food, but it’s a time honored cornerstone of local community. I’ve never been to the only kosher market in San Francisco but with I read that it is to close it’s doors, I started to think about the evolution of community and the impact the closure will have have kosher consumers in San Francisco. Perhaps this closure represent the erosion of a Jewish community, perhaps it’s another victim of the economy, or perhaps it is a symbol of the digital age – a time when we shop online, tweet, like and share our news to the point that we no longer depend on the local deli to learn of births, deaths and marriages. The internet can be blamed for destroying community. The internet has forced some local stores to close and has impacted “family dinner” by presenting itself on smart phones at dinner tables across the globe. That said, the internet is also bringing people together to build a new kind of community. In every country I have lived and every city I have moved to, there has been a social glue that bound community together; a mutual school, synagogue or common language. The internet makes it easier to spread that social glue. Through my Kosher Connections submissions (see them all here) I have met food bloggers that inspire me and have been challenged to cook things I would never have thought of alone. Our group is more than a bunch of foodies with a common ingredient, but a community of food writers that want to see each other succeed. It’s a community I want to share my best work with, and a community I know I can turn if I need to brainstorm, vent or share something that is not blog-worthy. I really didn’t want to go to the grocery story before cooking for this post and I remembered I had wonton wrappers in the fridge and salmon in the freezer. After a little research I discovered I am not the first to think that these ingredients would create a bite sized treat, but I didn’t have any of the things needed to recreate the baked wontons I found at Country Cleaver. 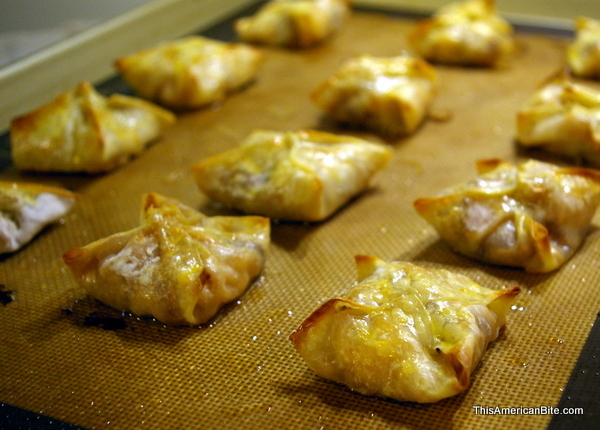 For the community of food bloggers around the globe that I have connected with since I started writing, I share with you Salmon Baked Wontons for the final Kosher Connections link up of the year. 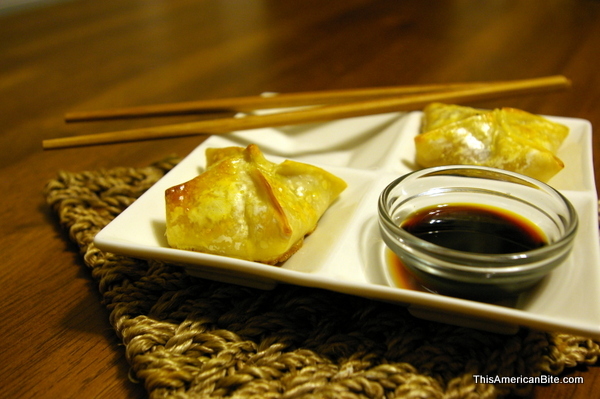 You will need the following ingredients for this Salmon Filled Baked Wonton Recipe. Makes 24 baked wontons. This is a “prep ahead” but “serve immediately dish. 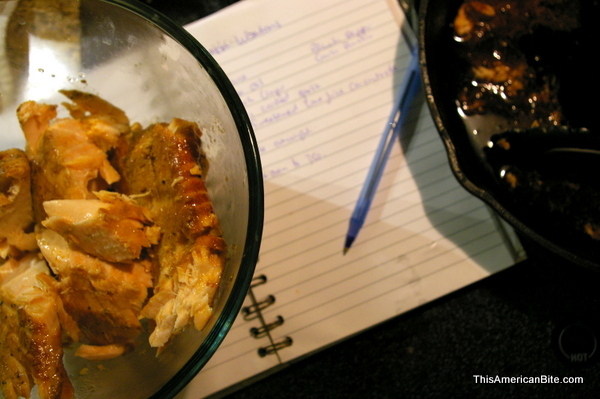 Start by putting your salmon in a sealable container. I love my glass storage containers but you could just as easily use a tupperware or ziplock. 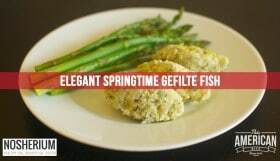 Drizzle with 1 tablespoon of soy sauce, 2 teaspoons of lime concentrate, crushed garlic, grated ginger a touch of black pepper and garlic powder. Allow to sit if the fridge for 24 hours – but if time is of the essence, 2 hours is the minimum I would suggest. Remove the salmon from the fridge. Put a tablespoon of coconut oil in the bottom of a cast iron skillet. 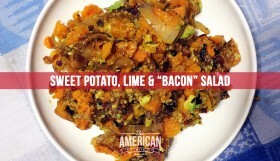 Later in this post you’ll understand why I am recommending the cast iron skillet for this. Put the skillet in the oven at 350 to melt the coconut oil, then bake the salmon for 15 minutes. Remove from the oven when there a nice sear on the underside and the flesh of the salmon is still flaky and pink. Do not overcook the salmon! It will cook a little more once the baked wontons have been assembled and we do not want it to dry out. 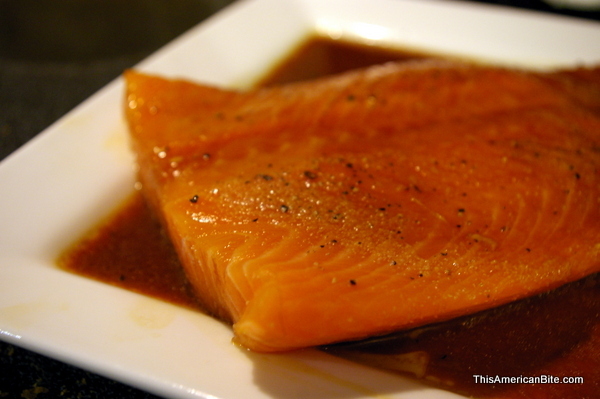 Set the salmon aside to cool, leaving the juices in the bottom of the skillet. Put the skillet on a medium heat, dice a red onion and add to the skillet. 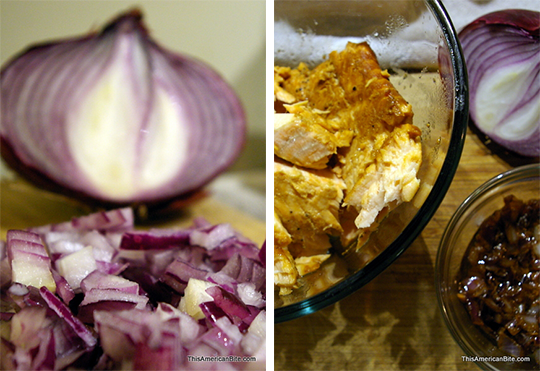 Sautee the red onion for five to eight minutes, until translucent and soft – but not crispy. Allow the onions to cool and combine with the salmon. Crack and beat one egg to use for egg wash. Set in a bowl. Open the wonton wrappers and place them on a damp piece of kitchen towel. This will prevent the wonton wrappers from drying out and becoming difficult to work with. Fold the kitchen towel over the top of the wonton wrappers so the top stays damp too. 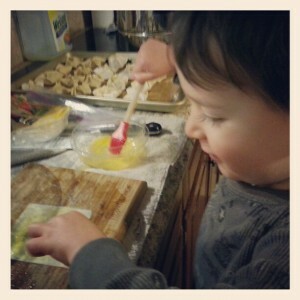 Paint the outer edge of the wonton wrapper with egg wash, or have your two year old join you in the kitchen at this point. Toddlers will love this part! 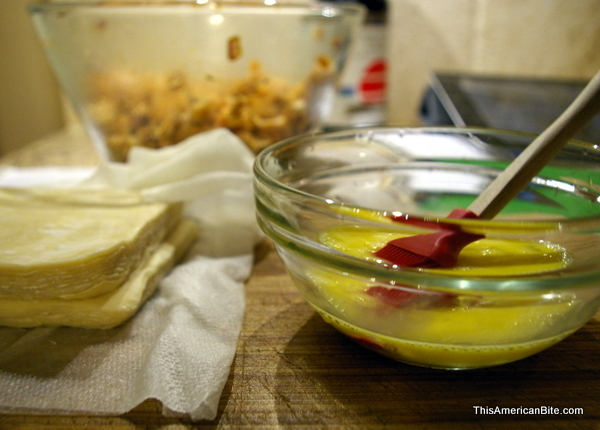 The eggwash will act as glue, keeping the wontons closed. 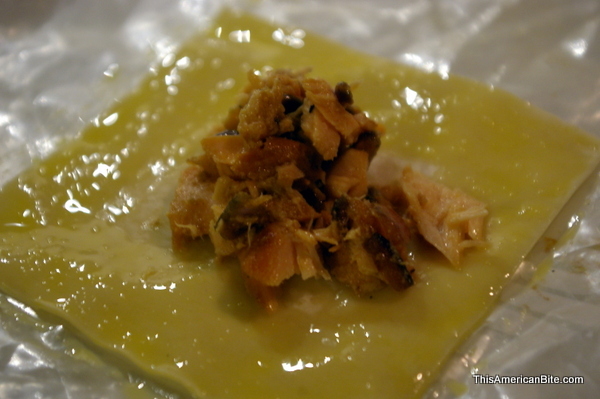 Spoon one teaspoon of the salmon mixture into the middle of the wonton. 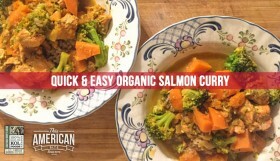 You may want to mix the salmon gently every few minutes as the juices and flavor will fall to the bottom of the bowl. At this point, pre-heat the oven to 350. Fold each of the corner of the wonton so they meet in the middle and place them on a cookie sheet covered with baking paper or a silpat. As a side note, my silicon baking sheet has become one of my most-depended on kitchen items since I started cooking with it a few months ago. They are not too expensive and they are awesome if you bake often. You can get them from Amazon. Once you have assembled your wontons, brush them with the rest of the eggwash and put in to the pre-heated oven (350 degrees) for no more than ten minutes. Remove from the oven when the baked wontons are golden brown and the edges have started to get a little more crispy. Allow them to cool for a few minutes. 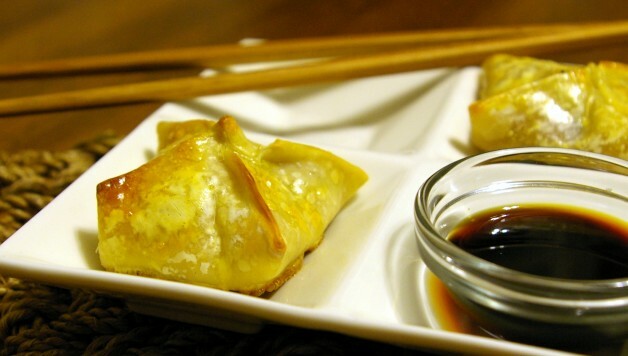 Serve your baked wontons with soy sauce or sweet chilli sauce for dipping. These are best served immediately. I made half of my baked wontons one night using half of the salmon and made another batch and although the salmon was still good the next day, I think they were best on day one! 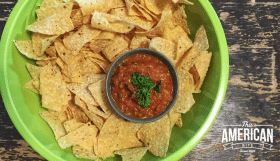 Thanks for being part of the This American Bite community. Be sure to check out the other Kosher Connections posts for the salmon theme, and leave a comment below and let me know when you’ll be serving up these baked wontons!